...on pampers, programming & pitching manure: Flip! Flap! Zap! No more glasses! I had my lasik surgery done this morning, and now here I sit, typing away sans-lunettes. Wow, I wish I'd done it long ago. Very cool, very quick, very painless. Here's a run-down of how it works for those interested. A while back, I had them check if I was a suitable candidate. See my post about it. They check to see your prescription, astigmatism, pupil size and corneal thickness to determine if you are a candidate. All was a go, surgery scheduled for today. 8:55: "Hello, give us your credit card". They then carefully removed $3400. This was the most painful part of the whole procedure. 9:00: I am invited into back room, given some eye drops to restrict blood flow in my cornea. I'm given Valium and a few other goodies to "help me relax". This alone may be worth a few hundred. I was feeling AWWWWESOMMMME. 9:20: after sitting around for a while letting the drugs kick in, they gave me some drops to numb my eye. They stang a bit and, the earlier joke aside, this was really the most painful part of the procedure. It was really nothing. 9:40: procedure finished. Out to sit in waiting room again. Things are blurry, but already way better than they used to be without glasses. 9:50: In for a quick exam with another doctor to make sure things look OK.
10:00 give me my eyedrops that I'll need for the next week, a souvenir travel mug, and I'm out the door. 10:15 Alisa picked me up out front. I could pick out her van from 2 blocks away. Awesome! The procedure itself was very cool. They place a small spring clamp on your eyelid to hold it open. You could shut it if you really tried, so they ask you to hold the eye open. 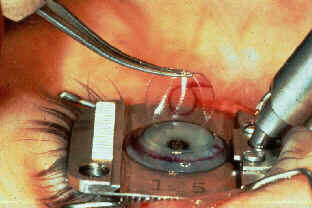 Then they place a small suction ring on your eyeball to hold it still. You barely feel anything. Don't let the gruesome image fool you. It's really painless. The fact that the blade vibrates like an electric carving knife is a bit disconcerting. The next step involves peeling back the flap so they can administer the laser. This is the coolest part of the procedure. Before they peel it back, you are focusing on a white light in a ring around a red dot. Then they peel back the lens that accounts for 70% of your visions focus and you then focus on NOTHING because everything's such a blur. Then then adminster the laser. You see some sparkly green light, and SMELL AN ACRID SMELL AS THE LASER VAPORIZES THE FLESH OF YOUR CORNEA. Holy Cow. What a great time to be alive. This is the stuff of science fiction. Anyhow, then he folds back the flap and smooths it out, making sure it's aligned and there's no debris, air bubbles, etc. The whole thing takes perhaps 3-4 minutes per eye. The rest of the day was spent putting drops in every 30 minutes for a few hours, then every 60 minutes. So far, no complications. I'd have done it sooner if I'd known how easy it was! that image looks straight out of clockwork orange. i'm locking my door tonight. not that i'm an old guy in a wheelchair...but still....amazing it really was that easy. Um, that image is not convincing me how much fun it was.